Rent Jumbo Trikes and Adult Tricycles in Denver, Colorado Springs, Aurora, Fort Collins, Lakewood, Colorado. Adult Tricycles are great for any type of party and can be ridden almost anywhere. 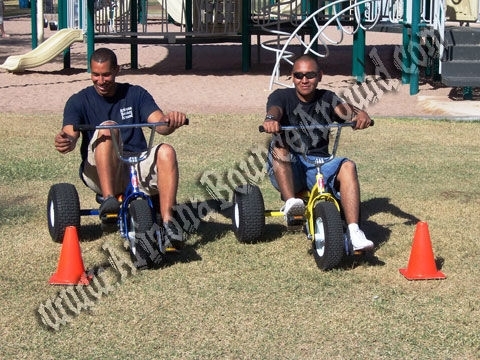 You can ride the big trikes at parks, block parties, company picnics or cookouts, inside the office building or your house party. Every one will have fun with the adult trike rentals from Gravity Play Events including parents, teachers or company staff. We also have a big inflatable race track for the Jumbo Trikes sure to please any age group. What a better way to have a company meeting or team building than to have a few laughs with co workers on the Giant trike rental. We only rent adult tricycles that sit low to the ground to make them more stable and feature comfortable back rests, pedals with grips and reflective safety tape for safety. Adult oversized trike rental comes complete with orange cones and skateboard helmets. We also rent huge inflatable race tracks to ride the oversize trikes in for that really cool race.